Kate Sarkodee speaks to Dr Anoma Pieris about her research into WW2 internment camps, the impact of confinement and the implications for contemporary issues of detention. 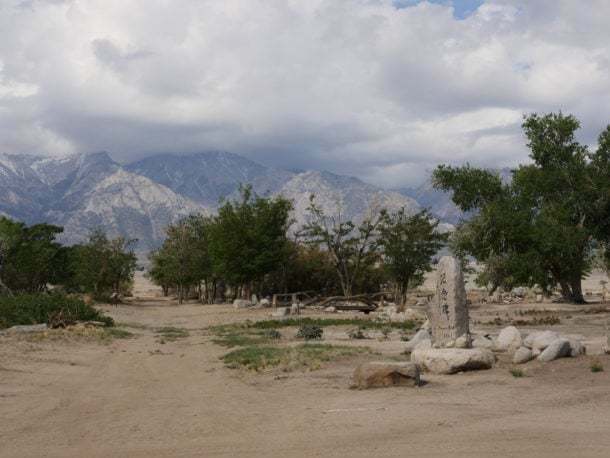 The remains of a community garden created by Japanese and Japanese American civilians incarcerated in the 10,000 person War Relocation Center from 1942–45; restored by National Park Service archaeologists, staff and Japanese American volunteers. Associate Professor Anoma Pieris of the Melbourne School of Design is undertaking a four-year research project titled Temporal cities, provisional citizens: architectures of internment. Funded by the Australian Research Council Future Fellowship scheme (2015–2018), her research explores how expertise in architecture and related fields was mobilized in the production of World War II internment environments and evaluates their legacy for histories of detention. Her intention is to understand the provisional forms of citizenship tested in these environments using comparative studies in Australia, Singapore and the USA. Her research has involved field visits to several former incarceration sites at Joetsu, Japan; at Manzanar, California in the USA; at New Denver, British Columbia in Canada; at Changi in Singapore and in Australia, so far, at Tatura, Murchison, Barmera (Loveday camp), Cowra and Hay. Her research in the United States is being conducted in collaboration with Dr. Lynne Horiuchi. Anoma, Australians often associate WWII internment with Australian prisoners of war in exceptionally harsh conditions such as Changi or on the Thai-Burma railway. Your research takes in a sweep of hundreds of internment environments across the Pacific. Broadly speaking, how did internment environments differ across this geography? As you mentioned, we do know about Changi and the Thai-Burma Railway but when we talk about civilian internment our mind shifts to the Holocaust … I want you to imagine this period as one during which models of camps – whether run by Japanese, Australians or Americans – proliferated across the Pacific, holding peoples from both sides of the conflict hostage. Let’s look at some approximate figures – 22,000 Australian servicemen and around 1,500 civilians were captured by the Japanese Imperial Army and confined in camps across Southeast Asia and Japan. These camps would have included Canadians, New Zealanders, Americans and the Dutch – a total of about 140,000 people. There were around 500 camps – with around 130 of these in Japan, typically associated with factories related to the war industry and detaining over 32,000 POWs. Then we have approximately 110-120,000 Japanese residents and Japanese American civilians from the West Coast of the United States of America incarcerated a few months after Pearl Harbour. The military evacuated these families to 17 assembly centres in racecourses and fairgrounds while they built 10 facilities ‘euphemistically’ called Relocation Centers in remote locations. These Japanese-American families were sent there for the duration of the war. In Canada, 21,000 residents and citizens of Japanese descent were sent to camps and housing settlements, many of them in the Canadian Rockies. So, for a period of around five years, from 1942 to 46, prison camps the size of small towns encircled the Pacific basin. If you look across this geography of camp environments you find military grids with barrack buildings, beautiful colonial bungalows, timber and attap (woven palm fronds) huts, timber warehouses, and cabins – all of which are functioning as prison buildings, because they are fenced in with guard towers, search lights and don’t have the insulation or amenities afforded to regular citizens. They don’t have civic spaces like theatres, churches, town halls or town squares where people might gather. They are dehumanising because they adopt the military model of accommodation, one that disciplines the populations within it. Civic deprivation becomes a kind of punishment. KS: How were Australians and the Australian state engaged in these wartime processes? AP: Around 25,000 POWs and 7,000 internees passed through the 18 or more (if you count prisons) camps in Australia. We incarcerated Italians, Germans, Japanese, Chinese, Portuguese, Javanese and others, both internees from countries that were Axis partners or were conquered by them, as well as seamen, pearlers, cane farmers, and fishermen from Australia and the Pacific Islands who were residents or born here. We received internees and POWs from Britain, functioning again as a prison, and we held POWs captured in the Pacific theatre of war. The Australia camps were purpose built by both the local communities and the military, and they kept altering the shape as the populations diversified. The largest camps were at Loveday in South Australia, Cowra in Hay, New South Wales, and Tatura and Murchison, Victoria. New Zealand confined a small number of German, Italian and Japanese male internees at Somes Island (Matiu) near Wellington, and later at Pahiatua in Hawkes Bay. When the war ended, around 100,000 Japanese were held in New Britain till they could be repatriated. So, you have to ask…. why we know so little about all this? KS: What is the purpose of internment environments and what is their relationship to notions of citizenship? AP: There are many theories on this. Michel Foucault looks at punitive environments in particular and the evolution of punishment as a form of social control. Giorgio Agamben focuses on the state of exception – like a state of emergency – often imposed in wartime where human beings are reduced to bare life, associated with the condition of exile or being stateless. The camp is a space which operates along these lines. Take, for example, the predicament of the 2,000 or so Jewish civilians who flee Europe to Britain’s refugee camps and are transported to Australia to be incarcerated alongside Nazi sympathisers in Tatura and Hay: many of them were Austrians, they spoke German and they were effectively stateless. This is very similar to the predicament of many refugees fleeing war-torn places today, who end up in refugee centres. KS: Our understanding of these environments is mostly through social history. What does it mean to spatialise their history and what are some insights gained from doing so? AP: When we imagine the Pacific Theatre of WWII we seldom think of it in spatial or architectural terms, except perhaps as represented in military monuments and memorials. These are the most concrete legacies of the war – say, for example, the Shrine of Remembrance in Melbourne or the Australian War Memorial in Canberra. We also speak of the heroism of combatants. But there were many Australians who spent the war in carceral facilities – in prisons, POW camps and in civilian internment camps, and this is true across the Pacific geography. Some of these were existing prison buildings or military barracks, others were purpose built with available materials – usually of an inferior quality … not the kinds of buildings you would learn about in an architectural history subject. Whatever they were, they had lasting social impacts on the communities in which they were located and the people who passed through them. They were dismantled after the war and sold off, so that even the materiality was erased. Conjecturing these environments gives this history greater substance, but also encourages heritage practices around actual physical spaces and remains. There is a huge difference between seeing an object in a museum and visiting the site on which history took place. You can see, for example, that the camp sites which have heritage listings or have commemorative structures like memorials or cemeteries have lasted, and people know of their history, while others have been completely forgotten. Cowra, NSW. 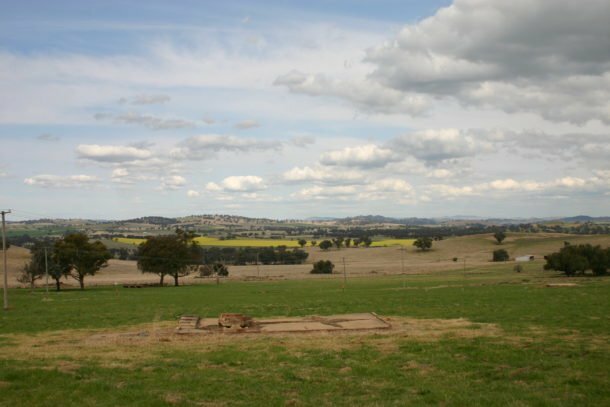 The remains of the Cowra Prisoner of War camp, site of the tragic breakout attempt by approx. 1,104 Japanese POWs in 1944 when 231 Japanese and 4 Australian soldiers were killed; now a heritage listed site. KS: The internment camp figures in the family history of many Australians, whether as a convict camp, a postwar migration camp, or more recently, an immigration detention centre. What is the role of the camp in the pathway to Australian citizenship and in our sense of ‘becoming’ Australian? AP: Yes indeed, why do we filter citizens through carceral facilities? – convicts through prisons and work camps, Aboriginal populations into segregated missions, stations and reserves, migrants through camps and hostels, and now detention centres…. Well the camp as a type is found in both Aboriginal and settler society, so it is not an unusual typology for Australia, and is also associated with freedom and leisure. But in this case the camp is a precursor to a kind of institutionalisation – whether it be punitive or a means for assimilating into a society. Institutionalisation is rehearsed at a minor scale in camp facilities. Institutionalisation – if we follow Foucault – is a tool for rationalising and managing populations, imposing order, disciplining them – all of which practices are exposed in the rawest sense in camp environments, but they are equally spaces of a counter culture that resists rationalisation. In fact internees often humanise their camp spaces by establishing institutions like theatres, schools and churches in barrack buildings and by growing vegetable and flower gardens. So what does it mean to be introduced to Australia through a camp? One could argue that it was the experience of many eighteenth and nineteenth century migrants, some free men or women and some not. The point is that citizenship is a combination of these two things freedom and control, and the camp – a carceral space that is visually porous – embodies this quality. KS: If we were to see Australia’s current immigration detention centres as a continuation of this narrative of internment, how do they compare with the camps that operated in Australia in the 1940s and 1950s? AP: It is interesting to note that some of the facilities we’ve been talking about – either the military or internment camps – were converted to immigrant reception centres after the war. The facility essentially remained the same but the status of the persons passing through it had changed – similar to the use of prisons for wartime civilian internment. Gradually these facilities were improved – and immigrant hostels were built between 1946 and 78 where immigrants received training and re-education. These were waiting rooms to citizenship in which migrants assimilated into Australian culture. Many immigrants think on this period and its spaces with nostalgia, largely because they functioned as large communities. Following the Migration Act of 1958 you have migrants and asylum seekers and, after the end of the White Australia Policy in 1972, what is considered a more flexible practice – for example, the acceptance of Vietnamese refugees in large numbers after the Vietnam War. The Migration Amendment Act of 1989 sought to restrict immigration and included detention of unauthorised arrivals. Since then the environment has grown increasingly punitive and with the Pacific Solution in 2001, unauthorised arrivals were detained on excised Pacific islands. In 2013 the entire mainland was excised from the migration zone. Border security strategies and immigration policies have a crude biopolitical function: they test the background, health, sanity, legitimacy, skill levels etc., of these unfortunate asylum seekers, even in their most abject state. The problems of the facilities remain unresolved – these are temporary facilities – numbered units with sparse rather hostile exterior spaces with none of the civic attributes that might humanise the experience of a disenfranchised population. More critically, the private contractors that run them don’t permit the kinds of modification – the gardens and civic uses – that wartime internees applied to transform these environments. There is a very poor understanding of the effects of confinement on human beings. And there is the added irony that the rules are being imposed by a population on someone else’s land! The question is why such conditions are normalised as acceptable accommodation. Kate Sarkodee wended her way to architecture via a degree in literature and languages followed by a number of years in the aged care sector focused on design for dementia. She is currently completing a Masters of Architecture at the Melbourne School of Design. Kate is interested in community-centric architecture and expressions of Australian identity. Anoma Pieris is associate professor at the Faculty of Architecture Building and Planning at the University of Melbourne. She is an architectural historian with a specialist focus on South and Southeast Asian architecture. Her interdisciplinary approach draws on history, anthropology and geography with an additional interest in gender studies. Anoma’s publications include Architecture and Nationalism in Sri Lanka: The trouser under the cloth (Routledge 2012) and Hidden Hands and Divided Landscapes: a penal history of Singapore’s plural society (University of Hawaii Press 2009). Anoma is co-author with Janet McGaw of the book Assembling the Centre: Architecture for Indigenous Cultures. Australia and Beyond (Routledge 2014).